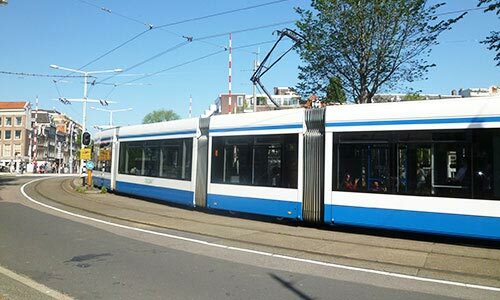 This is part 5 of a 7-part travel series on Holland, including how to travel to Holland, the Dutch culture, Dutch lifestyle, Dutch environment and essential things to know about the country. I’ve been repeatedly warned about the high cost of living in Europe before I came here. There are exaggerations about how it costs 3-4 times more expensive than Singapore (which is already an expensive place to live in compared to other South East Asian countries). Here’s my take – Yes, it is actually quite expensive (compared to SG/Asia Pacific). And at the same time, there are ways to work around the high costs. 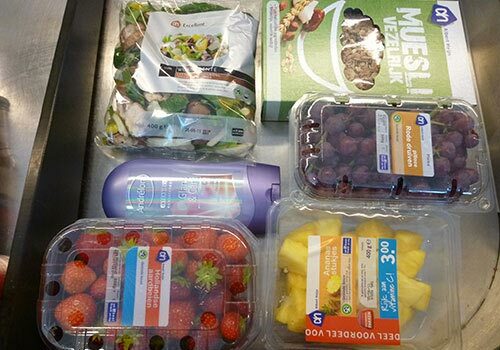 From top left, clockwise – Salad mix with mushrooms, Museli, Grapes, Pineapples, Strawberries, Hair conditioner. It amounted to $16.69 Euros. That’s about 50% more than it would have cost in Singapore ($11 Euros; $20 SGD). My bill at a local cafe, after hanging out and working there for a few hours. It amounted to $13.85 Euros (for 2 normal soups and 1 piece of walnut cake). About 50-60% more expensive than it would cost in a cafe in SG ($8 Euros; $14 SGD). Dinner at a normal restaurant in Amsterdam (Bread not part of the meal). This was split between me and my friend. Not only was it not filling (serving was much smaller than expected), the food was really bad – way too oily and poorly prepared. It amounted to about $27 Euros in total ($47.20 Sing). So all in all, things do cost more – ranging anywhere from 50% more, to 2-3 times more expensive. It’s normal to spend $20 Euros ($36 Sing) for dinner in a regular restaurant – that includes a simple drink, an appetizer and a main course. In Singapore, you can readily get the same kind of food for less than $10 Euros ($18 Sing). Fruits tend to cost more compared to in SEA since they’re probably less plentiful than South East Asia countries. I noticed skincare and toiletries (from same brand names) have a higher mark-up here (anywhere from 20-80% higher) than in Singapore too, probably due to higher operating and distribution costs. Just yesterday, I was out looking for a tweezer because I forgot to bring mine from Singapore. The cheapest one I could find was nearly $4 Euros! There was one that cost almost $9 Euros. And this was in your typical retail store. o_O Back in Singapore, you can easily get a tweezer for about $0.30 Euro or 50 cents Sing. What gives?!? Transportation costs are also high(er than Singapore). Average tram / bus / metro ride of just 3-4 stops costs $1 Euro ($1.8o SGD) – which would cost less than half in Singapore. If you want to commute across cities (within Holland), you take the Intercity Train. A 2-way train ride costs about anywhere from $10 to $30 Euros, depending on distance. Then there are the trains (Interrail, Bahn) that bring you to another country in Europe which cost more, but that’s outside the scope of this series. The plus point is you get a better value for accommodation in Holland compared to Singapore or Hong Kong. For the same rental, you have a much spacious apartment. One of my Dutch friends lives in an apartment in Middenwag Street (Amsterdam). It’s quite accessible by tram, and is near the supermarket and shops. Her monthly rent is $700 Euros/month – and it’s 2 storeys high, comes with 2 bedrooms, 1 living room, 1 kitchen, 1 study room, 1 bathroom, 1 store room and a balcony! I’ve been keeping track of my expenditures on Holland so far, and it’s been amounting to an average of $20 Euros a day. Sometimes more, sometimes less. I wouldn’t say it’s low (there were unnecessary expenses I could have cut out here and there), but overall it’s pretty good. This includes everything, from transport (tram, metro, etc); occasional recreation like watching a movie, shopping, going for concert, prepaid card for local calls, grocery shopping; dining out; toiletries; etc. None for accommodation as I’ve been staying with friends or friends’ friends. 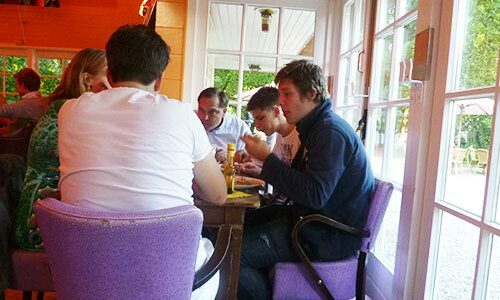 Occasionally when eating out, my friends would take the bill on my behalf. Note that I don’t visit tourist attractions, which would probably have been a big expenditure in itself. 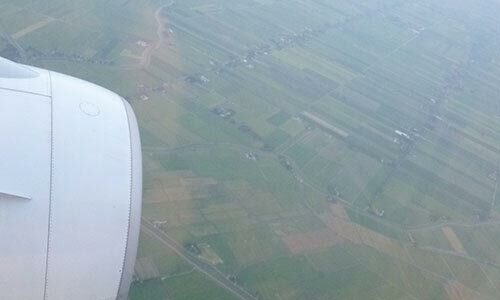 I think if you are really frugal in your Holland trip, you’ll have no problems spending lesser than me. Many days, I would work and eat out at cafes because I want to be out there immersing in the culture and connecting with people, so that naturally leads to a higher average expenditure. That said, don’t be too hung up on saving money and limit your experience. Set a reasonable budget for your trip ($30 Euros/day would be good, excluding accommodation), then just enjoy yourself while you’re here. Below are some tips I have on how you can save some money during your trip. For one, you don’t have to eat out for every single meal. You can easily whip up a nice meal with simple items from the supermarket. So for example, a usual brunch for me this week consists: 2-3 falafels, grapes, a few table spoons of hummus, 1 serving of salad and 1 pack of chocolate soy milk. Sometimes mushroom soup. I buy these items in bulk at Albert Heijn, which can last me about 1 week. So on a cost per meal basis, it’s less than $2 Euros/meal. That’s quite economical. For dinner, I usually eat out since I’m meeting friends/people. More on this below. Even if you want an instant, ready made meal, there are prepacked meals at just $3-5 Euros (we’re talking about complete ready-made meals, with pasta, sauce, toppings, etc). There is a huge of variety of prepacked meals here – more so than in Singapore. 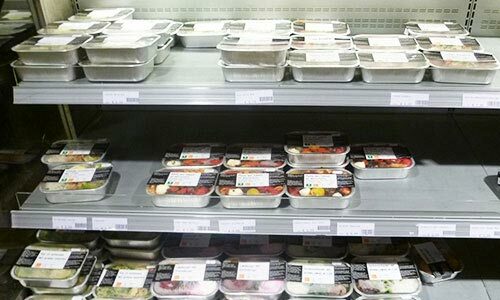 Prepacked meals in a supermarket. Servings are sizable too, so you can well divide each pack into 2 meals. 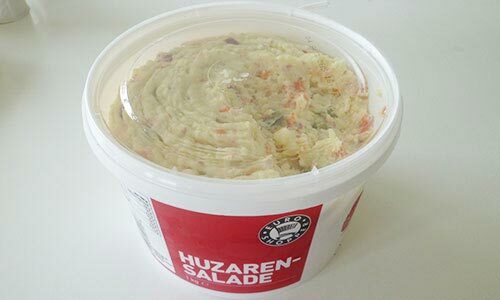 This tub is 1kg – 1 serving is about 100g. No idea why it’s so cheap – but I’ll take it any day! Plus it tastes good. Bread also seems to be cheaper, maybe because it’s a staple in the Dutch diet (a typical Dutch breakfast and lunch includes bread). I saw a very long loaf of multi-grain bread selling for just $1.29 Euros at Albert Heijn, which would probably cost more in Singapore. I’m not a fan of bread though, so I didn’t buy any. Salad mixes are also much cheaper than in Singapore (with more variety), ranging from less than a Euro (2-3 servings) to $2-3 Euros for a big pack (good for 5-6 servings or more). These can be found at any of the supermarkets. 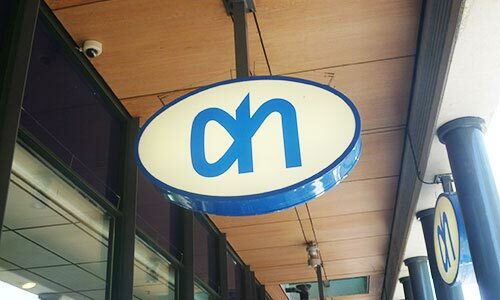 Thirdly, there are provision stores and discount supermarkets (Aldi & Lidl) that are much cheaper than Albert Heijn. 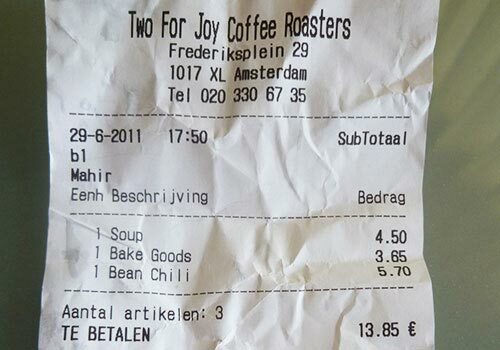 Albert Heijn is considered a premium supermarket chain, so prices are more marked up. Yesterday, I went to a turkish provision store with my Dutch friend, Olivia, at Middenwag Street which sells vegetables, fruits, spices, and a range of groceries. Olivia said the prices can be cheaper by as much as 50% here! I recommend to check out different supermarkets (check the websites to find their locations) and stores first to check out the prices, then figure out your weekly shopping plan. According to Oli, some supermarkets have good weekly specials, ranging from 15-35% discount – sometimes even as high as 50%! Fourthly, if you’re eating out, there are always the pricey restaurants and the economical ones. Just like there are the restaurants in Dempsey Road and Paragon in Singapore vs. hawker centers. 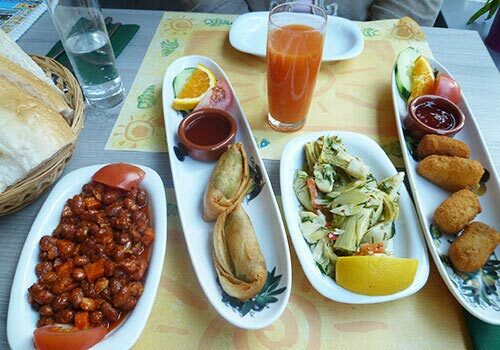 Go for the ones with good value for money – I’ve eaten at the pricier restaurants which aren’t that fantastic, while some of the cheaper places have surprisingly better food. Also, there’s no need to order a full meal with appetizer, main course, drink and dessert when you eat out – get a few sides or just a main course. Then have a supper at home if you’re still hungry. This will help to control your costs. The good thing is tax (6%) is inclusive of the prices here, so what you see is what you have to pay – whereas in Singapore you pay an additional 17% on top of the listed menu prices. 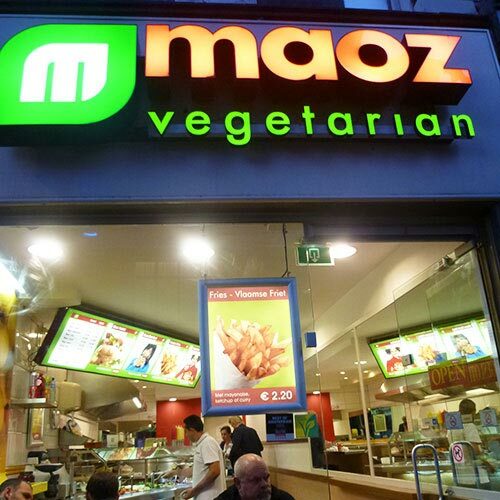 Maoz Vegetarian is popular vegetarian fast food chain in Holland. You can fill yourself up with just their falafel + pita bread (+ unlimited refills) for just $4.40 Euros ($8 SGD). The outlet in this picture is at Leidseplein. I’m very fortunate in that I’ve been staying with friends and friends’ friends who’ve been very gracious to house me throughout my Holland trip, so there hasn’t been a need for me to worry about accommodation. 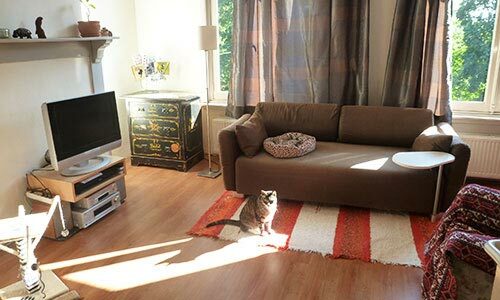 However, even if you don’t have friends you can stay with in Holland, there are many low-cost accommodation options. If you’re staying in Holland for over a month, consider renting a room. Craigslist is an excellent place to start. There’s also Expatriates.com (you may find same listings on Craigslist and Expatriates). And Kamernet.NL, which is a leading room network in Netherlands (some listings are in Dutch, which you can use Google Translate). It’s not difficult to get a room for $300 Euros/month (including utilities/internet/etc). Just make sure the person you’re dealing with is reliable before getting into any agreements. Then there’s Couch Surfing, which is a worldwide network connecting travelers with members of local communities who offer free accommodation. There, you’ll find good-natured samaritans who offer their places for travelers to stay (from a few days, to as long as a few weeks (or even more)). If you’re planning to stay here for an extended period of time, you should consider getting a bicycle. You can buy one for about $150 Euro and sell it for $100 Euro when you leave. Or, rent it. I found that Dutch people have a healthy range of hobbies, likely due to (1) emphasis on work-life balance in their culture, which gives them time to explore different interests (2) access to different nature sites, which makes it easier to pursue adventure sports/hobbies. The culture of “Gezellig” truly permeates throughout the whole of Holland. 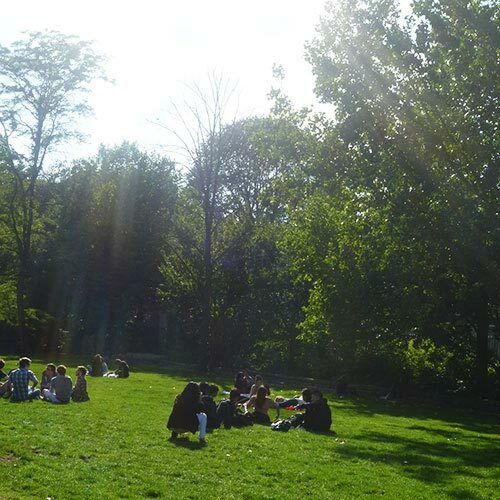 For example, just walking along a city, you’ll notice a disproportionately high number of parks, street benches and cafes in Holland where people would just hang out and relax. 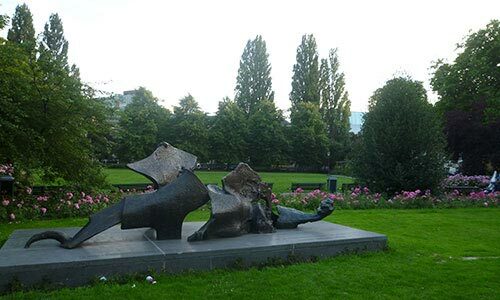 A park in Amsterdam. This is near Plantage Middenlaan, where I’m staying with my friend. Notice there the benches in the background. Many people would sit there and chill out in the day, when the sun is out. Just walking along the streets, it’s usual to see people/individuals just sitting outside a cafe, sitting on a bench in the park or laying out on the plains and soaking in the sunlight. The other day I was out jogging, and I saw a lady laying out a mat on the grass, probably getting ready to lie in sun for the whole afternoon. I also saw many people, of all ages, just sitting on the benches and doing nothing – relaxing, basically. Quite a contrast when stacked against societies like Singapore or Hong Kong. In Singapore, people are very time bound and always on a schedule, rarely taking time out to relax. Even when they do relax, it’s a specific activity that’s scheduled, to be completed by a certain time frame! I was amazed by how widespread cycling is in Holland. It’s basically a country-wide phenomenon, with cycling tracks built as part of the roads and pedestrian crossings for the cyclists. More on this in Part-6 of the series on Traveling in Holland. Everyone and his/her grandmother know how to cycle in Holland. Seriously. 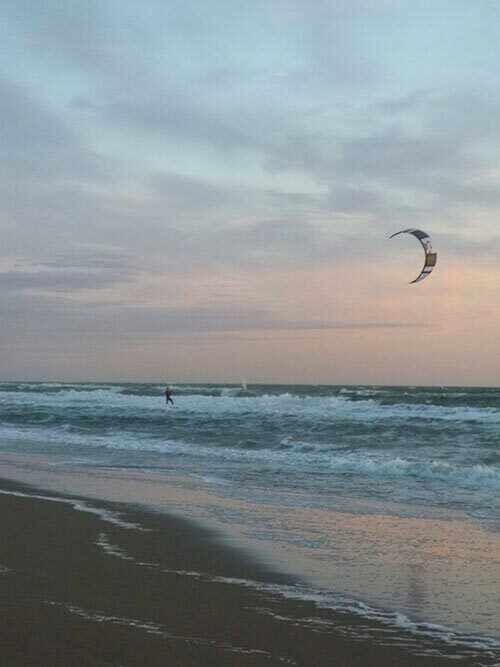 Because it’s so windy in Holland, kite surfing is a common sport. On the same note, other sea sports like wind surfing and wakeboarding are also quite popular I believe. Many of my Dutch friends would go surfing during the weekends. Kite surfing is “an adventure surface water sport that has been described as combining wakeboarding, windsurfing, surfing, paragliding and gymnastics into one extreme sport. 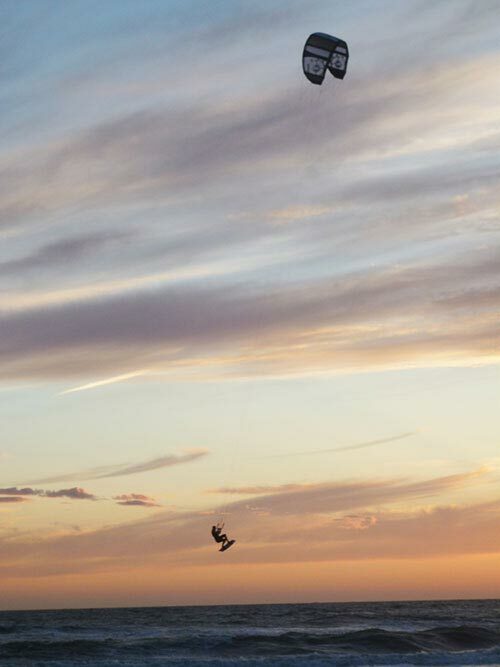 Kitesurfing harnesses the power of the wind to propel a rider across the water on a small surfboard or a kiteboard”. 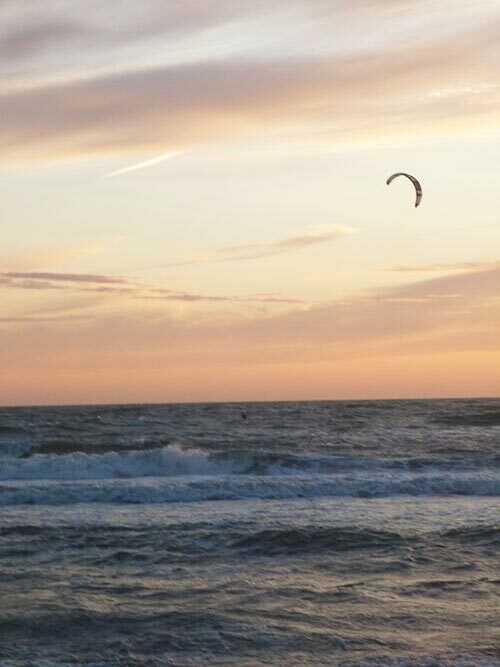 I came across some people kite surfing while out enjoying the sunset at the beach of Noordwijk. Check out the person in action below! And up he goes! The person was literally flying in the sky for a good half minute there! That was quite surreal just watching it. I think he must have gotten an insane adrenaline rush!! Picnics and barbecues are quite common as well, as weekend activities. 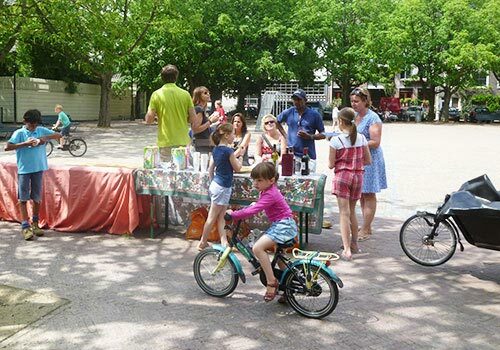 As I mentioned in The Dutch Culture, Part 2, parents will hang out with other parents over champagne/beer/simple picnic, while their kids playing around with their bicycles in the park. Great way to catch-up and connect with one another! 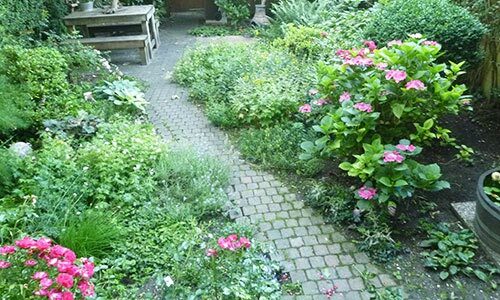 In cities like Utrecht and Hoofddorp where land is more plentiful, it’s not uncommon to have your own garden. Those who do usually grow their vegetables, after which they harvest and eat them. Some grow their flowers too! Below is a shot of my friend’s home garden in Utrecht – Yes, she grows her own vegetables and flowers! 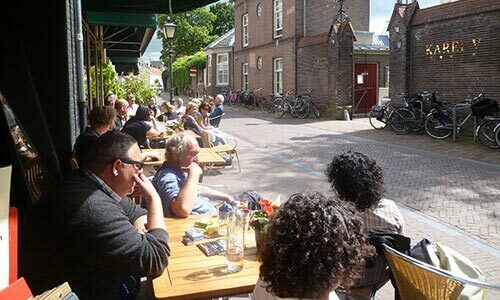 As people who value relationships and community/togetherness, the Dutch spend a lot of time with family and friends – be it bonding over meals, or just chatting with one another at home, and so on. 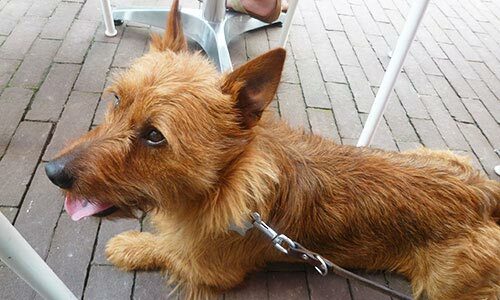 Many people have pets here, most common being dogs, cats and rabbits. 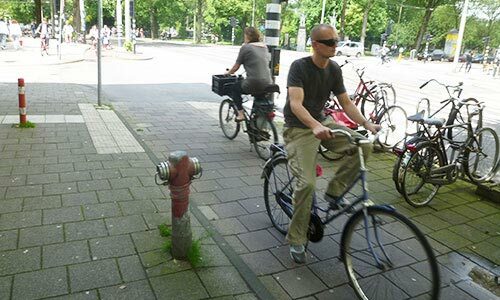 Half the time you can see someone walking a dog on the streets, or cycling on the road with a dog on the leash! The good thing about staying in Holland is that it’s a convenient gateway to a lot of European countries. Now that I’ve been here for a few weeks, it’s not surprising why many foreigners choose to live in Amsterdam, just as foreigners want to stay in Singapore because it’s a central hub to the countries in Asia/South East Asia. Not to mention, the culture here is very conducive and accepting of foreigners – more so than other European countries I imagine. Many people take weekend or week-long trips to Belgium (right below Holland), Germany (to the east), France (to the south), Italy, Czech Republic; or upwards to Norway and Sweden. Just a few weeks ago, my Dutch friend was in Prague for her birthday, and this weekend she’ll be in France. I’ve 2 other Dutch friends who just went to Italy for a vacation trip last week. Continue on to Part 6 on Traveling in Holland.